Located in the desert state of Rajasthan, Ranthambore National Park is spread around an area of 392 sq kilometers and is situated in the Sawai Madhopur district. 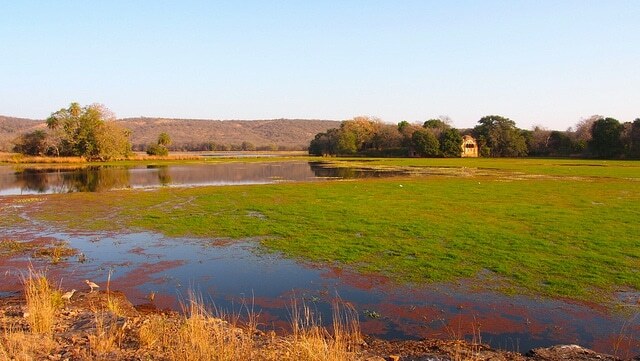 The reserve forest is located on the edge of a plateau and is bordered on two sides by the Chambal and the Banas rivers. The forests in Ranthambore surround the historical Ranthambore fort and were once used by the Kachwaha Rajput Family that ruled the region with the city of Jaipur as the capital, as a hunting and gaming reserve. After the independence the Indian Government established the forests as a reserve forest in 1955 and a Tiger reserve in 1973. The area was then enlarged in the subsequent years and now encompasses the Sawai Man Singh and the Keladevi Wildlife sanctuaries. The sanctuary is famous for its vast and extremely camera friendly Tiger population and is visited by tourists from all around the globe. The park comprises of a typical deciduous forest which is common with most jungles in the central Indian region. It is also a home to 539 various species of flowering plants and the terrain mostly comprises of forests and open grasslands. Being located in Rajasthan, Ranthambore enjoys a dry subtropical climate. The summer months start from March and continue till mid-July. The temperatures can be extreme during these months and can go up to 40 degrees. The monsoon months start from late-July and the area receives moderate rainfall till the first week of September. The months from October till December are quiet pleasant and moderately warm with cool evening temperatures. The winter months fall between December and February and the temperatures can go as low as 2 degrees during the peak winters. The jungles of Ranthambore are famous since decades for its tiger population and are the best place to see the creatures in their natural environment. Apart from the tigers Ranthambore houses a wide variety of wildlife species and bird species which are endemic to this region. Animals – Tigers, Leopards, Hyenas, Sambhar Deer, Chital, Hanuman Langur, Nilgai, Macaques, Jungle cats, Jackals, Sloth Bear, Indian Wild Boar, Indian Mole rat, Porcupine, Black Bucks and Common Mongoose etc. Reptiles – Marsh crocodiles, monitor lizards, tortoise, cobras, common kraits, Ganges Soft-shell turtles, Indian Pythons, Rat snake, Russell’s viper and the Indian chameleon etc. Nearest Airport – The nearest airport to Ranthambore National park is located in the state capital Jaipur which is almost 150 Kilometers away by road. Trains from Jaipur to Sawai Madhopur are available frequently. Nearest Railway Station – The closest railway station to Ranthambore is the Sawai Madhopur railway station which is accessible via all major cities like Jaipur, Kota and Ajmer etc. and is just 12-13 kilometers away from the park. Road Accessibility – Sawai Madhopur can be easily reached via bus or taxi from most major cities in Rajasthan with regular buses from Jaipur, Kota and Ajmer. There is a plethora of accommodation facilities available near Ranthambore however advance bookings are advised if you plan to visit during peak seasons. The service and the hospitality provided in Rajasthan are usually very good with most hotels and people are friendly and helpful. There are various RTDC hotels for the mid-ranged accommodation with simple yet nice facilities. There is no entry fees for the Safaris and you are only supposed to pay if you carry any sort of video camera. Photographic cameras are allowed free of charge. Useful contacts for bookings and accommodation.